Released in November 2018, explore a Voodoo theme in Baron Samedi, their latest offering to a grateful slot community. Baron Samedi, so my Wikipedia research tells me, was quite the character. Samedi is a Loa (intermediary between God and humanity) of the dead in Haitian Voodoo, helping the dead pass on to the other side and ensuring all corpses rot in the ground to stop any soul from being brought back as a brainless zombie. He also loves his rum, cigars, dirty jokes, and chasing mortal women despite being married to another Loa, Maman Brigitte. 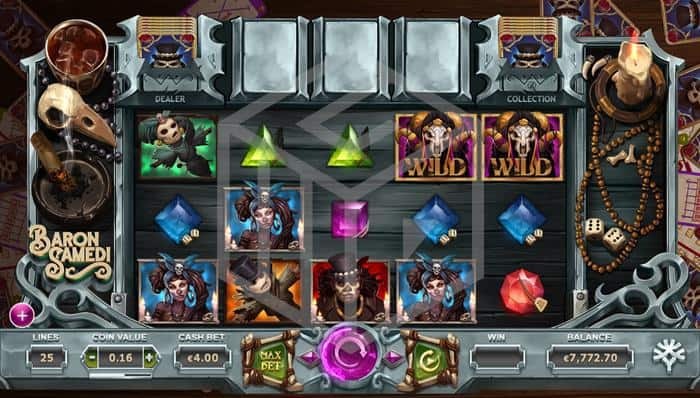 Baron Samedi is a 5x3 reel slot with 25 fixed pay lines and an RTP of 97%. Tarot cards, respins, and free spins are the way to the Baron’s Voodoo riches and you can try your luck from €0.25 up to €125 per spin and is of medium volatility. As usual with Yggdrasil games, the design is superb. The game board is set on a table top with tarot cards scattered above and below the board. The board itself appears to have been fashioned out of wrought iron and either side of the reels you see fantastically drawn Voodoo objects such as a bird’s skull, neck-beads, dice, bones, animated burning candles and a smoking cigar, while in the corner a sliver beaker of what looks like blood sits with ice cubes bobbing around the surface. There are also placeholders for three tarot cards above the reels, and these come into play during the bonus rounds. There are 8 regular symbols. 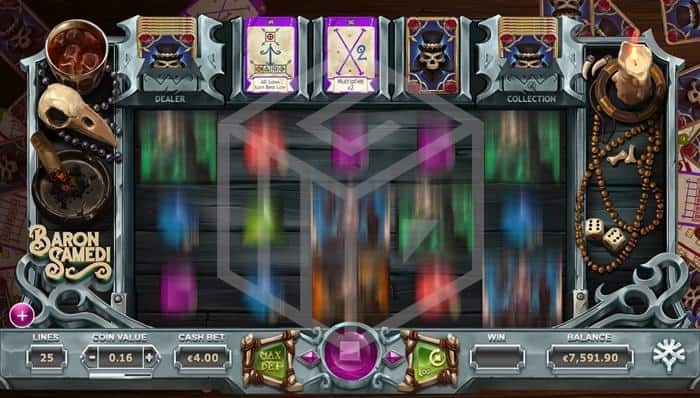 The low-value symbols are represented by purple, blue, green and red gemstone, while the higher value symbols are green and brown Voodoo dolls, Maman Brigitte and Baron Samedi, the highest value symbol, who pays 4.8x bet size for 5 on a pay line. There is also a wild symbol of a scary looking skull in ceremonial Voodoo attire (which seems to be relatively abundant during gameplay) and the scatter is the Voodoo free spin card. There is also a Mystery symbol which is of a bottle of rum on a green background. This only appears during the bonus rounds and will turn into a random symbol at the end of the spin. The special features in Baron Samedi both operate in the same way and they are the Voodoo Respin, Voodoo Free Spins and Extra Free Spins. A Voodoo respin is triggered when 2 scatter symbols land in one spin. Prior to the spin starting the three placeholders above the reels are each allotted a random Tarot card, and each one will in some way enhance your free spin. 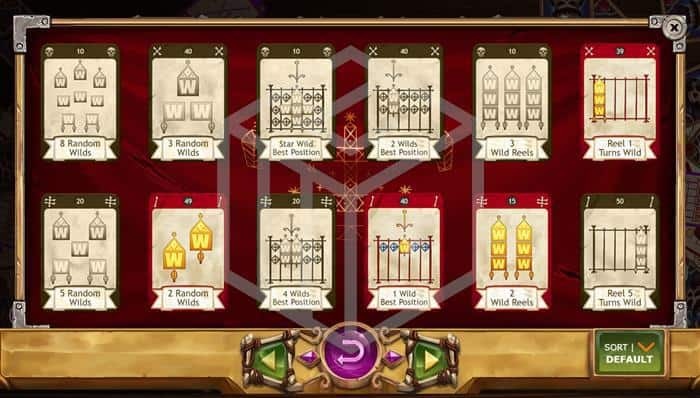 There are 36 different cards in total and they award enhancements such as; win multipliers, stacked symbols, random wilds, guaranteed five of a kind, mystery symbols (and so on and so forth). All enhancements will be applied to your respin thus increasing your chances of winning. Free spins are awarded by landing 3 or more scatters on the reels. Land 3 for 7 respins, 4 for 12 free spins, and 5 for 15 free spins. Incidentally, if you are lucky enough to land 5 scatters in one spin you’ll win a huge 1000x your bet size on top of the free spins. The free spins operate in exactly the same way as the respin, although after each spin you will receive three new tarot cards. 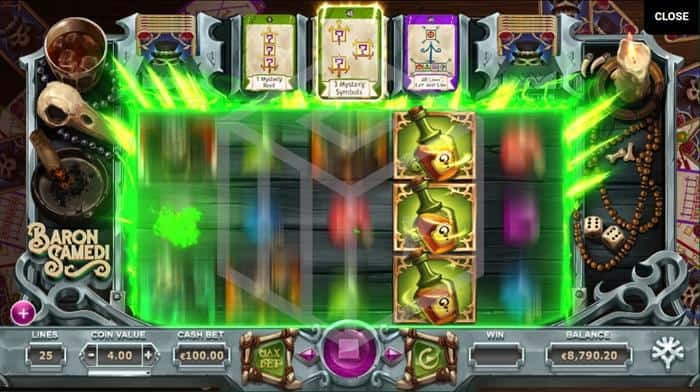 Baron Samedi is an extremely ambitious slot from Yggdrasil and one that has been executed amazingly well. As always with Yggdrasil, the design and animation are second to none – everything looks superb. Also, the special features with all their intricacies are well thought out, unique, and highly enjoyable to play. With so many tarot cards with so many different functions and strengths and collections it may seem a little confusing and daunting at first, but trust us that it takes no time at all to get used to it. Basically, all you need to know is that during any free spin you’ll get 3 tarot cards to help your chances of landing a win – the rest of it will follow along without the need for you to know any more than that until you figure it out for yourself. I can actually see this game appealing across the board. Certainly, rec players will go for it but as it sits pretty much smack bang in the middle in terms of volatility there are enough wins to keep the low variance players happy, and the free spins offer the chance for some pretty big wins for those who want a little more action. Another great release from Yggdrasil who just seem to be getting better and better.